We used to have a Slack integration where there was a Slack channel that updated whenever someone posted on our Forumbee community. That stopped working about 10 days ago, and I don't believe anything changed on our side. Anyone else experiencing this? Is there a fix? Hi Alicia , thanks for your question! Sorry to hear that. We have had similar reports and the team is looking into it. In the mean time, you can reconnect your channel by going to Admin > Integrations > Slack and clicking 'reconnect channel'. Thank you! Apologies, but you are not authorized to install Forumbee. If you’d like, you can message one of your admins and ask them to install this app. The link doesn't go anywhere - just opens the Slack application. 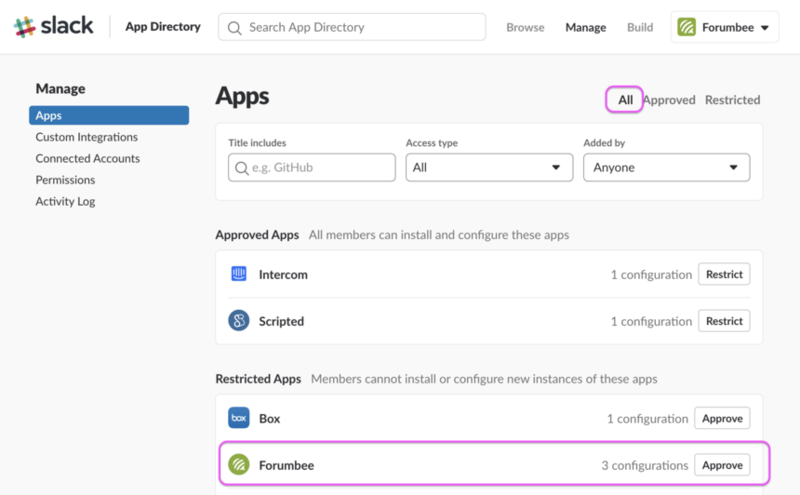 So I asked our Slack Admin to re-enable Forumbee, but he said he no longer sees it in the list of apps that can be enabled in Slack.